Wednesday 26th June, Glasgow Against Atos occupied the Emirates Arena, Commonwealth Games venue, on London Road. 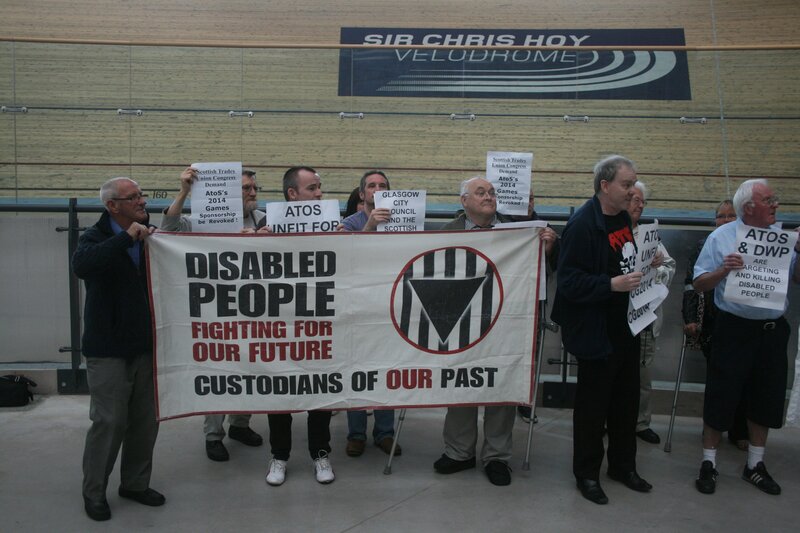 The group were protesting against the French IT firm Atos sponsoring the games. 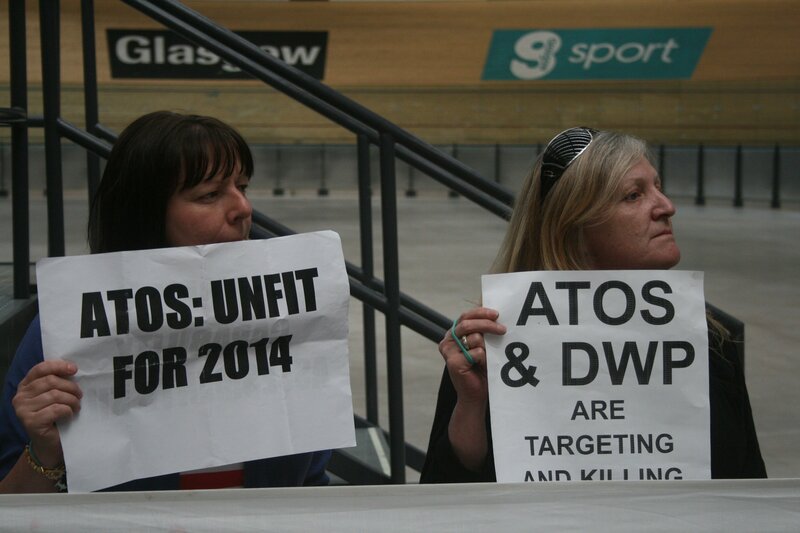 The protestors, who occupied the Chris Hoy velodrome for well over an hour, argued that Atos are “unfit” to sponsor the games due to their punitive role in degrading ‘work capability assessments’ for the Department of Work and Pensions (DWP). Atos is the private, profit-driven parent company of Atos Healthcare. Atos Healthcare provides ‘independent’ data for the making of a decision on an individual’s right to receive disability benefits. To provide this data Atos introduced the controversial target-driven assessment scheme which has received trenchant criticism from Atos victims, disabled groups, the Citizens Advice Bureau, Child Poverty Action Group, and even by the Atos doctors who conduct the assessments. According to the UK Government’s own figures, 1,100 people have died after being put into the work-related activity group and 1,600 people have died before their assessment was complete. The accuracy of these statistics is difficult to gauge, but the assessments carried out by Atos are clearly mentally and physically harmful and have certainly contributed towards the deaths of many vulnerable people. 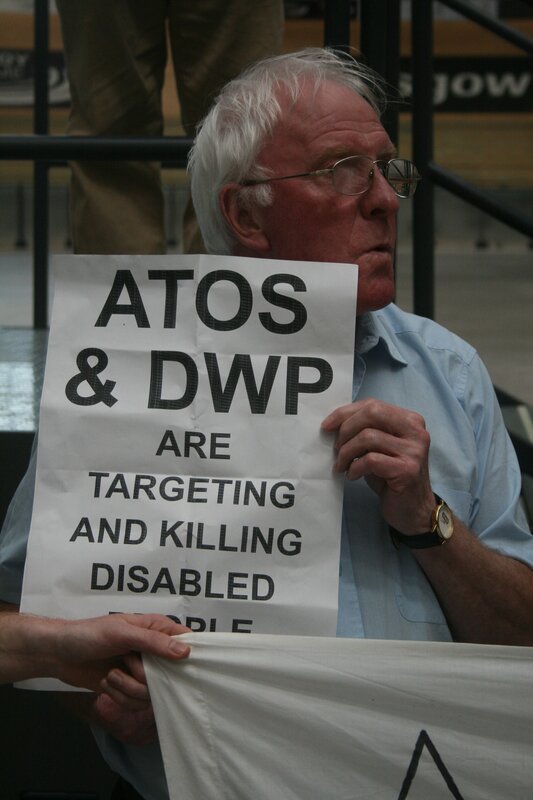 The group’s position is clear: Atos kills. Atos are “unfit” to sponsor the games, and should be dropped immediately. “They are attacking disabled and vulnerable people and overseeing the destruction of people’s lives. The Commonwealth Games should stop the contract with Atos”. “They’ve tried to put me through things that I can’t do. It’s quite degrading. And I was up again last summer and this time it was worse because of Atos. The people before were a wee bit more sympathetic towards you and your illness but this time it was just more about putting things on to the computer. They don’t really want to look at you or know you. It’s very degrading and I think its wrong that they are taking people that are terminally ill and sick up to this place and trying to get them off benefits”. The assessments causes an immense amount of stress for people as their benefits are at a severe risk. Debbie from Maryhill explained her own stressful experience of Atos over the last four years as being like “a hamster in a cage going round and round for years”. In a recent Guardian article GP Greg Wood has said that the Atos assessment process is not appropriate for its purpose as the assessment “leans towards finding reasons not to award points“. 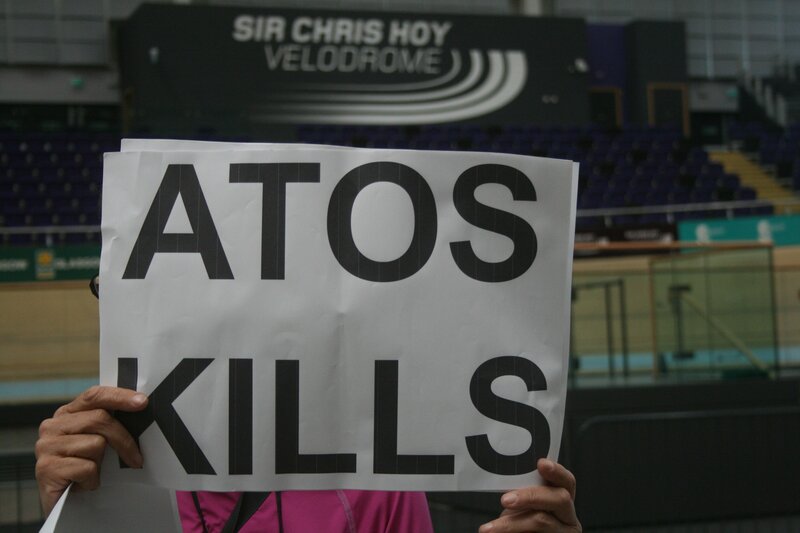 One campaigner at the velodrome said that Atos assessments were like “the new Lourdes” as long-term illnesses and disabilities “magically disappeared” after assessment. As well as sponsoring the Games, Atos will provide the IT accreditation systems that will be used to accredit all participants, and the Games Information System that will relay results, information and schedules to media and officials. The will also provide the volunteer systems to facilitate the recruitment and management of 15,000 volunteers. Given that 36.8% of the local working population of Calton claims benefits, and 30.6% in Shettleston (www.sns.gov.uk), the fact that 15,000 people will give their labour for free for up to 11 days in the East end is a travesty. The Atos role in Games volunteering is only the other side of their assessments procedure. The Atos assessments are effectively about making people work for free or placing them in a situation of ‘working poverty’. When “the norm” in Glasgow is becoming a “low wage and casualised work environment” or an “unregulated and degraded training system”, what else could it be? The assessments have proven to be intrusive and inappropriate for the often vulnerable groups who are being assessed. Many of these stories are widely available. Atos are currently processing nearly 11,000 benefit applicants a week and are clearly exploiting an essential branch of the welfare state for profit. Atos are unfit to be sponsors of the Commonwealth Games because ATOS KILLS. The decision to let ATOS become a major sponsor for the 2014 Commonwealth Games in Glasgow has sparked great anger due to the shocking and degrading assessment processes adopted by Atos healthcare. Yesterday’s occupation highlights that the sponsorship is a disgrace. Atos must be dropped as a sponsor of the Games, or the Games ‘legacy’ will end up being a further attack on the vulnerable and disabled.